Dirt Candy is one of my favorite vegetarian restaurants in the city, and the dishes manage to consistently be both imaginative and delicious. Chef Cohen and her restaurant are doing fantastic, and they’re even opening up a bigger restaurant (because it’s really small and hard to get reservations at right now) in fall 2014. You can see her blog post about it here. Michelle: The maple butter was crack. I could eat that butter all day long. I debated eating it straight up with a spoon, like you’d eat Nutella. 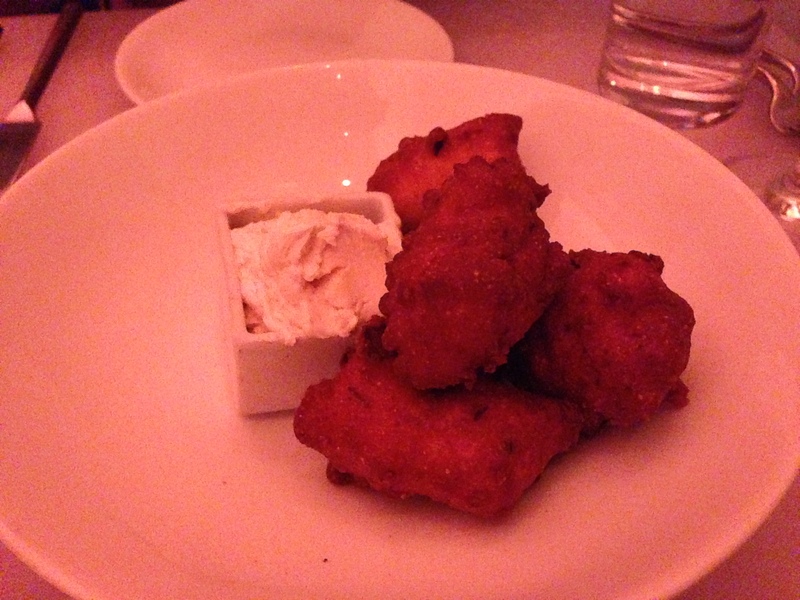 The hush puppies were delicious too. Not too spicy. Victor: The hush puppies are good. The jalapeño flavor isn’t too strong; it’s just right. However, I can’t say that they’re that special. The maple butter, though, actually is fantastic. The butter’s smooth, soft, and easy to cut through, and the maple flavor manages to shine through (without being distracting). It does a fantastic job of complementing the hush puppies. Eating the two together forms a great combination of sweet, spicy, salty, and umami! Hot potato salad, crispy Japanese yams, grilled sweet potato, olives, bitter greens, and apples. Michelle: This was probably my dream come true. Potatoes in every form possible. Including fry-like potatoes on top. 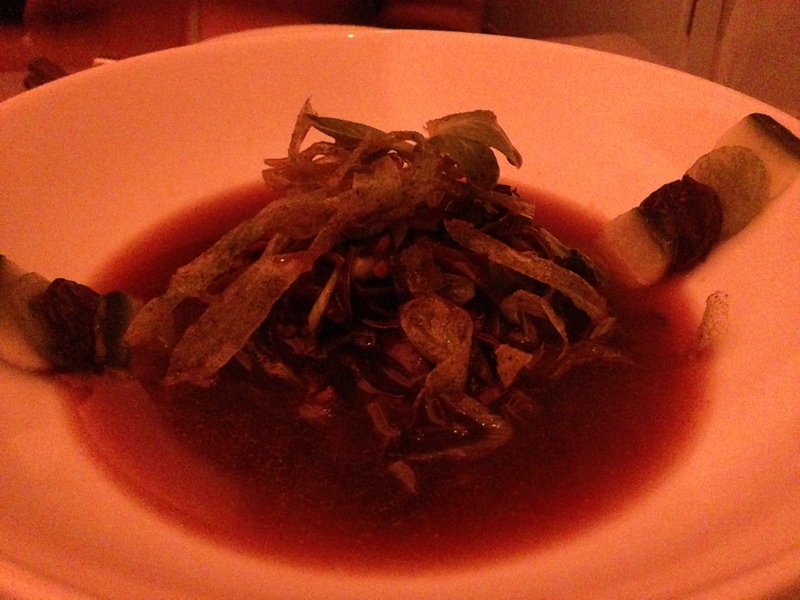 Roasted cucumber hot & sour soup, black sesame, garlic chili oil, wood ear mushroom, and cucumber jelly. Michelle: The jellies were pleasing to eat. Perfectly squishy. They also reminded of zebras. I usually hate hot and sour soup, but I liked this. The jellies may have helped. 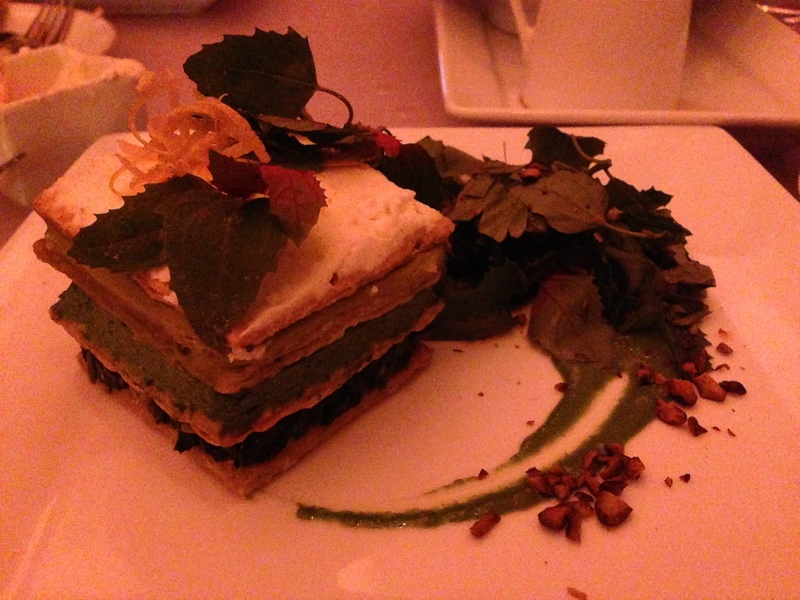 Spinach and grapefruit mille-feuille with smoked pistachios and ricotta. Michelle: This would be the savory, rustic, hearty farmer brother to the lady m cake… if farmer brothers ate spinach. 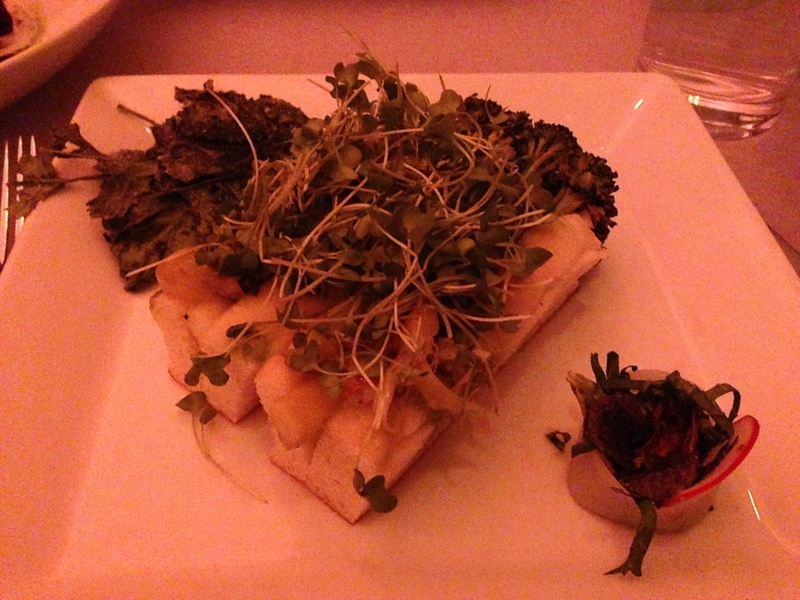 Victor: I love the spinach mille-feuille here. The spinach, grapefruit, and ricotta parts are rich and creamy, and the pastry layers and pistachios help cut through the richness. It’s really hearty, reminiscent of heartier meat dishes. 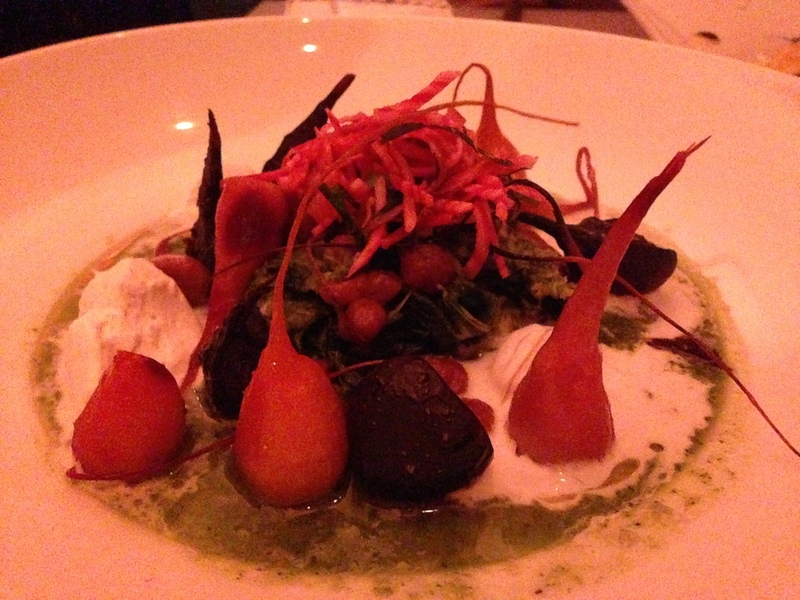 Beet gnocchi, salt-roasted beets, Thai green curry, whipped galangal coconut cream. Victor: Chef Cohen has a pretty good blog post on how this dish came to be; you can read it here. Michelle: I didn’t get the beet gnocchi. Like where is the gnocchi? I ate lots of beet here though. 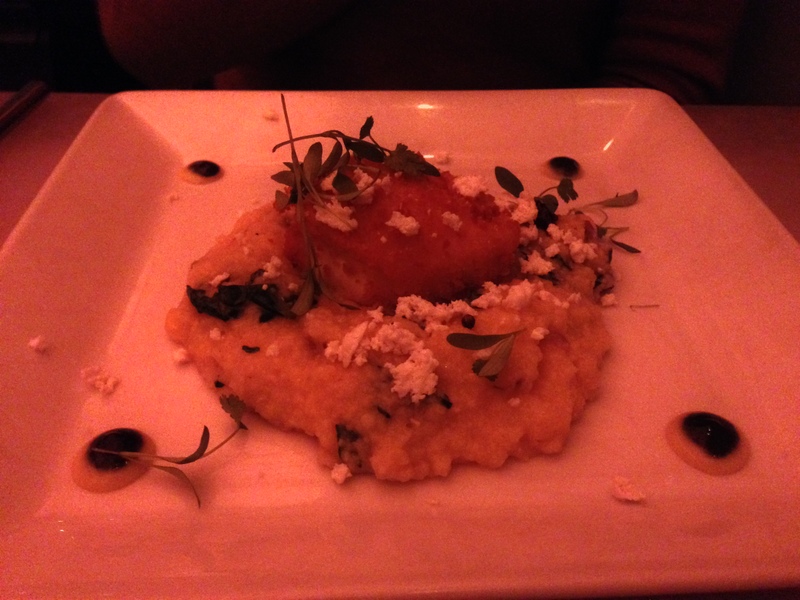 Stone-ground grits, tempura-poached egg, corn cream, and pickled shiitake mushrooms. 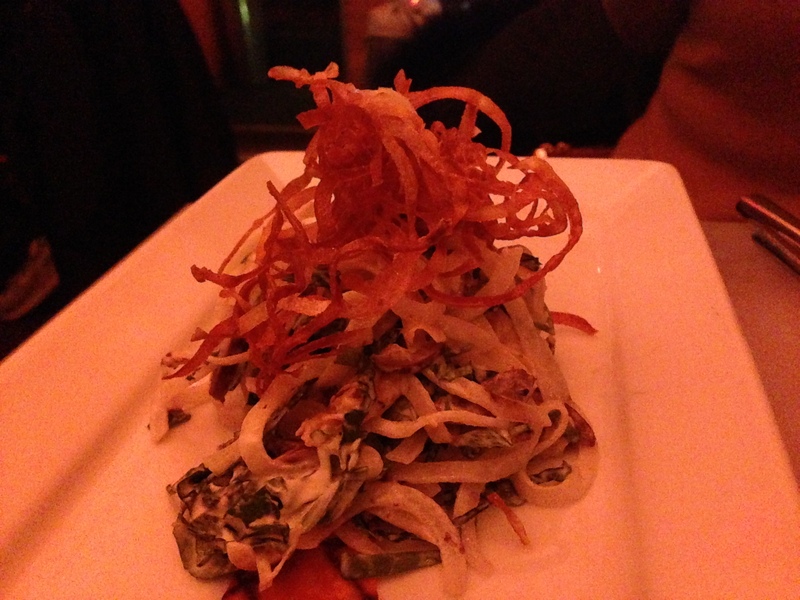 Michelle: I fully enjoyed this dish. As did Victor. Because Chris doesn’t eat egg and neither of us remembered/cared about what she disliked most in the world. I’d want this egg as the egg in my eggs Benedict. Victor: I love eggs. And I love grits. Combining the two (especially with the creamy yolk going around) with the corn cream yielded an amazing result. 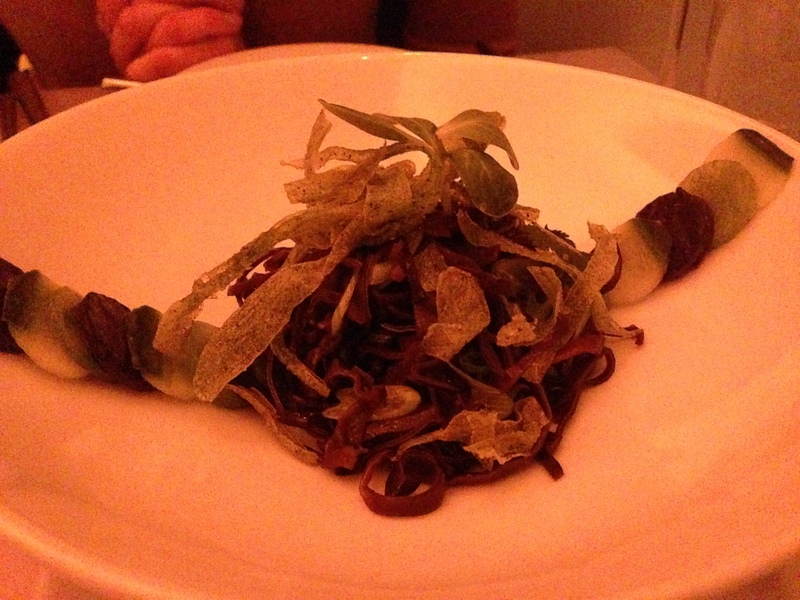 There wasn’t anything acidic in this dish; it felt very rustic and earthy, and that’s how I liked it. Smoked broccoli dogs, broccoli kraut, and salt & vinegar broccoli rabe. Michelle: The healthiest hot dog ever. Except not really because it’s got white bread and the fattiest mayo thing. But this was still my favorite. Maybe this is how parents can get their kids to eat broccoli. Victor: The hot dogs here have a lot of broccoli flavor, but they also managed to have a very “meaty” feel to them. It’s hard to explain it well because it sounds silly for this to be “meaty” until you actually try it! Ditto what Michelle said. I would totally eat this as a kid, and I did NOT like broccoli when I was young. 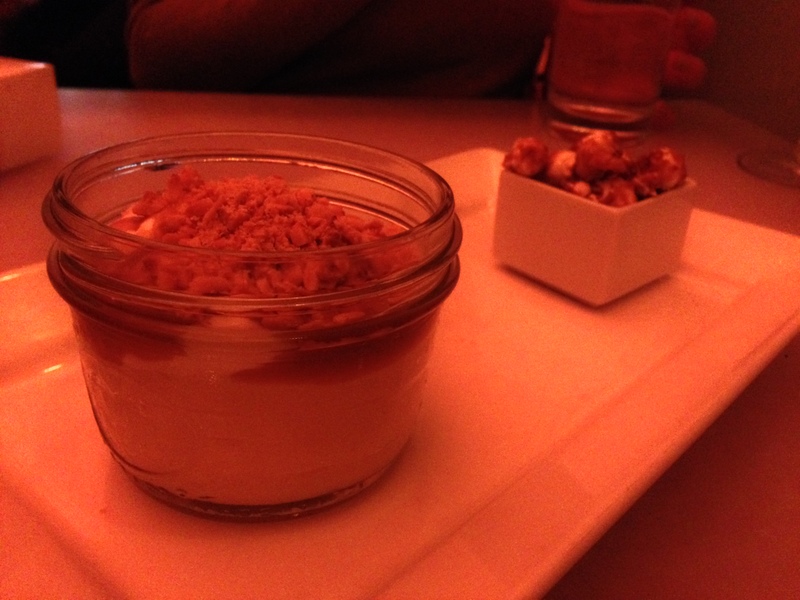 Popcorn pudding with butterscotch, hazelnut, and caramel. Served with salted caramel popcorn on the side. Michelle: My absolute f***ing favorite. Victor: This is one of those desserts where you decide to try a bite and inevitably end up taking more and more bites until it’s all gone… even though you told yourself you wouldn’t touch any desserts because of the carbs/sugar. NYC: All’onda (Mar. 2014) NYC: Eleven Madison Park (Feb. 2014): New Menu!